It's time for another challenge over at Frilly and Funkie. Cec is our hostess this time around and she has chosen the theme "IT'S A SMALL SMALL WORLD". 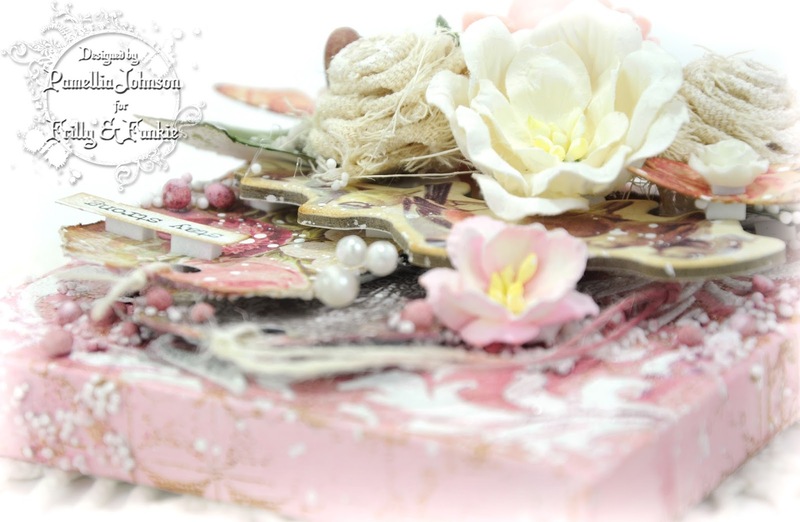 She would like you to create or alter something small in a shabby chic or vintage style. Your finished project can be anything from 1 inch to 4 inches and it does not have to be flat. Be creative and let us know in your post just how small your project is. One lucky winner will receive a $25 gift certificate to Linda's shop The Funkie Junkie Boutique! In honour of all things small, I put this canvas together with two of my sweet little squirrels in mind. Their names are LINDA and PRINCESS and you will get to meet them at the end of the post. 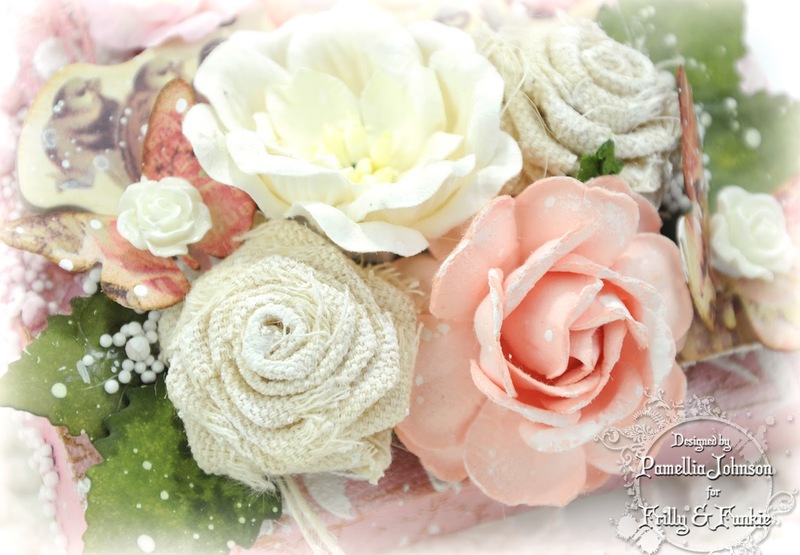 The fabric roses are handmade using a burlap fringe ribbon. Easy to do and they go with anything! I used some Prima Art Stones regular size to add texture. They are fantastic and I will be picking up some of the small Art Stones as well because the styrofoam balls I usually use don't take the colour of inks as amazing as the stones do. I am postponing the photos from our adventures of Escape from Belfountain mountain until Friday so we can concentrate on my two little miracles for today. I know, I know, the anticipation is killing you, but I'll be back, I promise!! lol. Just my token after dinner shot for now. OK, and one quick pick of my handsome little dude JUNIOR because who can resist this face! I have been feeding Linda on the path and out my window since we moved here. You've seen a few pictures of her along the way. A few months ago, I noticed a mass forming on the side of her face and neck. Last month it had gotten so big that she could barely open her mouth to get food in. You could see the pain on her face as she tried to eat and I was really concerned that she was going to starve to death. Not on my watch, so I started cutting up wafer thin slices of avocado and leaving them to get extra soft. Thankfully, she was able to eat it, and started coming to the balcony twice a day to fill her tummy. I was so happy last week when the mass started to drain. She is back on a healthy nut and veggie diet again and the lump is almost gone. She still has some healing to do, but I think the worst is over. Princess has been visiting me since last November, but I have never posted a photo of her before today. Just a couple weeks after we first met, she was in a horrible accident that took her left eye and damaged the left side of her body. I never thought she would survive. It was touch and go all winter as she lost her appetite and was nothing but skin and bones, and then again in the spring when it looked like infection had set in, but she is tough as nails and she hung in there through it all. She seems to be fully recovered now, and although she only has one eye and has a bit of a limp, she seems healthy and happy again. What a trooper! I tell you their stories, not to make you sad, but to inspire you. These small creatures have strength that I could only dream of and I am in awe of their sheer will and ability to overcome. I dedicate this post and this canvas to them. Stay strong PRINCESS and LINDA! Amazing card and sad stories about Princess and Linda. I wish all the best to them. Another lovely creation with your unique and beautiful artwork Pamellia. Just love the little piece you made with them in mind. How the heck you got all the things in such a small space I can only imagine. It is stunning. OMG..I wasn't sad really until you ended your post and it made me cry..such brave strong little creatures..Junior looks like himself..sleeping or eating..[ the little cutie] and your little canvas is gorgeous..so much detail on such a small space and so pretty. Faboulas canvas Pamellia dedicated to your little furry friends, love the roses must try them, pretty colours all round. What an amazing chunky little canvas. I love that within it's tiny dimensions you have managed to cram so much detail, texture and interest - amazing creation! Amazing the textures and colours are fantastic Pamellia, pleased your fur baby is on the mend. Wonderful stories Pamellia... they really are strong and we could learn so much from animals ... Your card is stunning as always and those stones are fabulous! Awww, I'm feeling a bit choked up after reading about what these two little animals have been through...and survived . I hate seeing animals ill or injured and go to pieces if my dog is suffering, but am often amazed at how quickly and how well they recover compared to us humans! Three cheers for these brave and determined little squirrels, lucky they had a helping hand to survive the winter! Your canvas is stunning...of course! 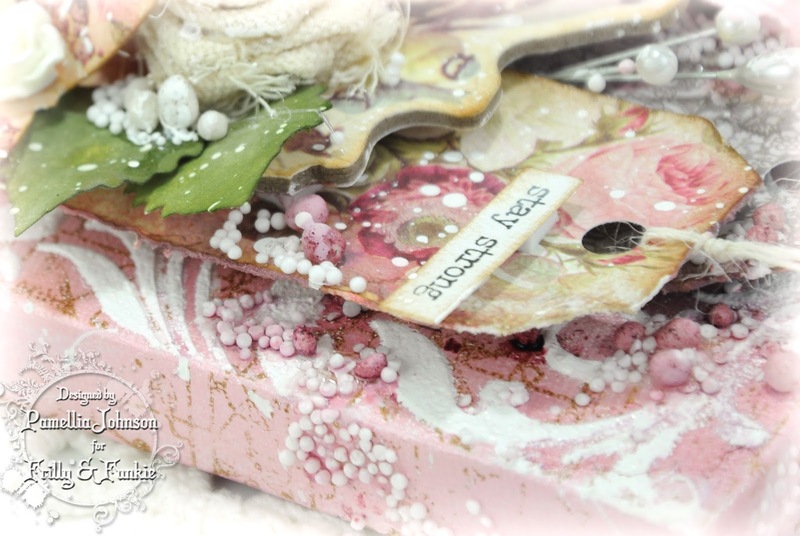 Beautiful canvas Pamellia, and the hand made roses are gorgeous! Simply gorgeous canvas - love those layered tags - and I'm so impressed with the resilience of Linda and Princess, thank you for sharing their stories. 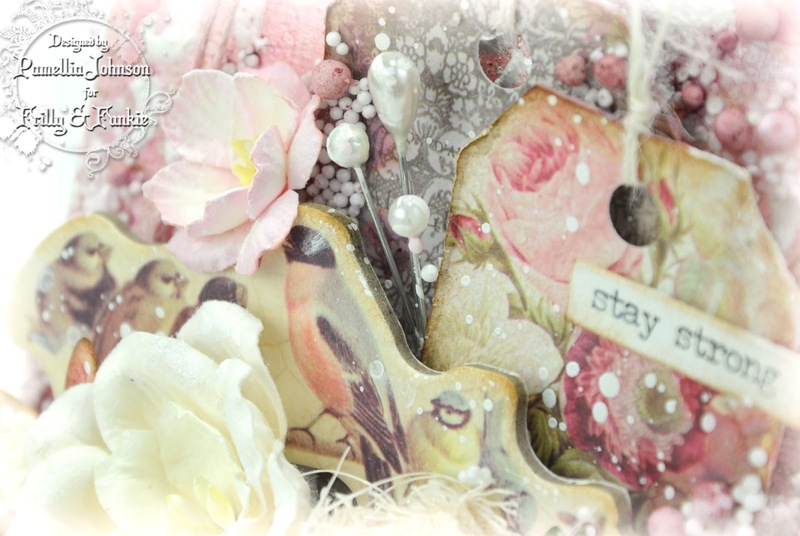 You have had a so kind tought making this card inspired to them, and it's just amazing and sweet as you are... Love any detail, the soft colours, the textures, the birdies, the papers, the tag... Oh, all is a joy for the eyes!! The little art stones stunned me, such a marvellous product they are, give a so beautiful dimensional touch and love how you have coloured them! And your handmade fabric roses with burlap fringe ribbon look so gorgous!! Great tip, thanks for sharing! I pinned this piece of art! Oh Pamellia! What a great post. We could learn a thing or two from Linda and Princess and their enduring spirit. And I think we've learned some wonderful things from you too about having compassion and being creative in the way we help others. Love this small canvas. Again your layers and use of colors just amaze me!!! Oh what a gorgeous canvas and how sweet to dedicate it to you two furry friends,they are so fortunate to have you to care for them . You are special for sure . Gorgeous mini canvas Pamellia, love the layer and beautiful embellishments. Two incredible squirrels, so happy they have made a wonderful recovery. I love this tiny canvas, Pamellia! It is so beautiful! The art stones are a perfect accent. What a touching story of Linda and Princess. They and the other furry friends are very lucky to have you. Oh my gosh, what brave little warriors! The canvas is the perfect tribute! Every single detail is stunning! I can't believe how much you packed into such a small footprint, beautiful and exquisite! Your canvas is stunning!!!! The colors and details are just so beautiful! Very nice work! The arrangment and colors are so lovely! A stunning mini canvas befitting two determined little squirrels. And one super determined adopted human mommy! So glad the little ones are on the mend. And I'm blown away by the intricacy and yet delicateness of your canvas. Wow! I'm lost for words AGAIN! 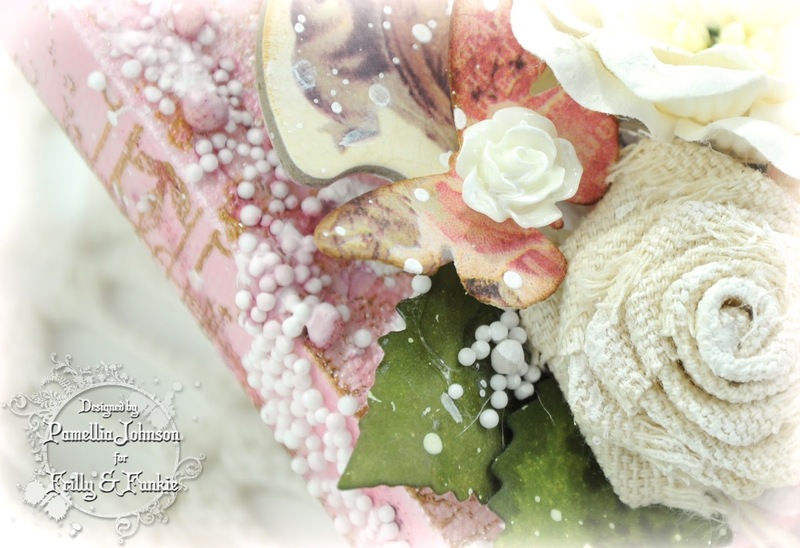 this is truly awesome, so much texture and beauty, love the burlap rose and EVERYTHING else. Your little family of squirrels are so lucky to have found their saviour in so many ways, how thoughtful of you to see the pain and need in these little animals and get them back to health. Poignant message in this post. It touched my heart. STUNNING canvas - love the sides. It's a show piece. And your stories about your babies are incredible. You are an amazing woman Pamellia. Xj. My dear friend, your heart is as beautiful as they come... what a gorgeous canvas inspired by such strength and sweetness! I'm sending tons of hugs and prayers to sweet Linda and Princess. 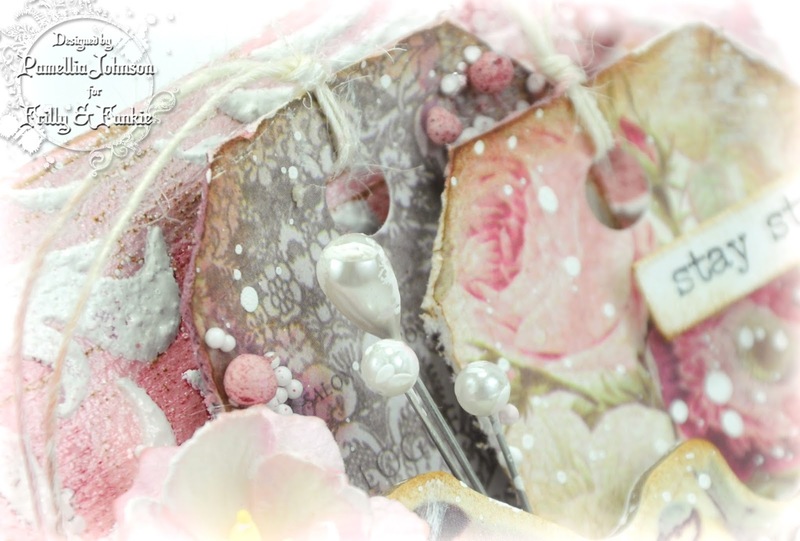 Your design is just gorgeous and I am in love with those fabric roses you made. Can you imagine them in Autumn pieces? They're like a warm snuggly blanket of happiness. :o) The background is so pretty and I love your use of the Art Stones. They have been on my wish list and I am eager to play with them. I didn't realize they took color so well! Your tags are gorgeous and I love your sentiment choice. Beautifully designed as always, Pamellia. You are a gift. :o) Sending extra love to you and your sweet critter friends today! Very pretty canvas with lots of goodies to look at. Love the floral focal point, especially the rolled burlap ribbon flower. OMG, Pamellia, what a brilliant tribute to Linda and Princes! Oh, I love how you used those awesome art stones and your flowers are fantastic, as always! It's so elegant, romantic and so beautiful! You have managed to put so many awesome layers together onto this small project! It's stunning, my friend! Stunning canvass Pamellia, all of that texture and layers crammed into such a small layout. 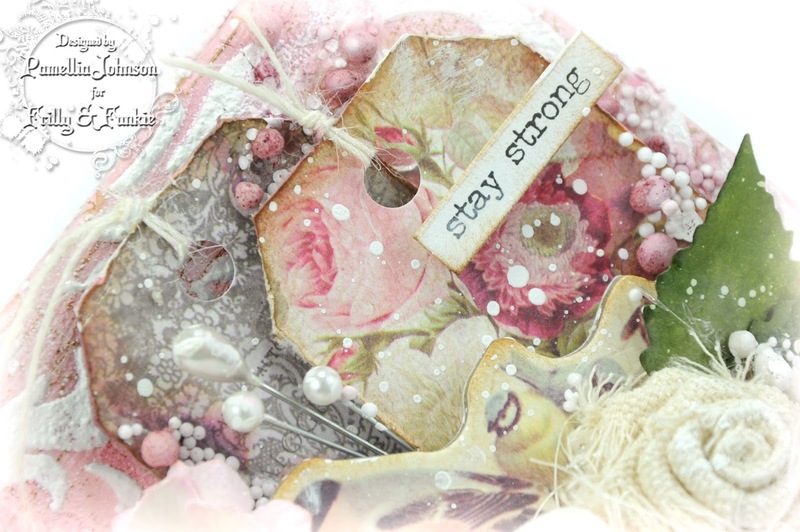 I am quite inspired to try something similar myself and I have added the little art stones to my shopping list. 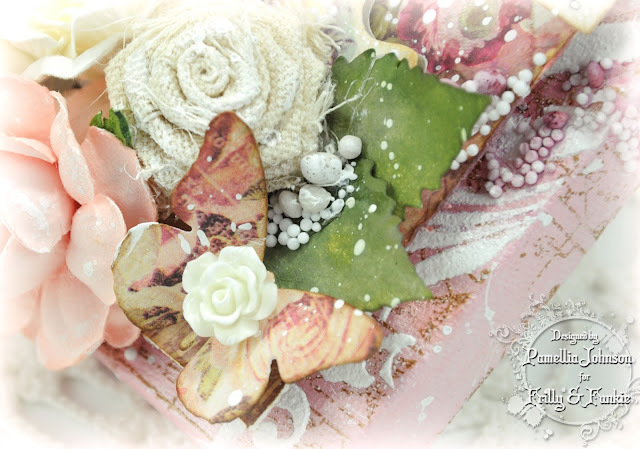 Do you think there might be a little video tutorial on how to make those flowers? Your two little ladies are amazing, just when you are convinced the worse will happen, Mother Nature really surprizes you. Wow, your canvas is absolutely divine. Everything about it is beautiful. What fabulous stories about the girlies. Hope these tales of animal fortitude give you hope for your dear Scully. first of all its a great post and your canvas is absolutely stunning, you are the Queen of layering and detail. Loved reading the stories of Linda and Princess, who most probably would be in squirrel heaven without your care. I think that animals have a strength of survival that they call upon in difficult times. You truly are their friend to help them along their way. Will wonders never cease! You amaze me each time you design something and I know how much you like pink but this takes the cake! GORGEOUS dear Bubbles! Ohlala! Those art stones sure are fun and do take color very well. I'll have to try the AI ink next. 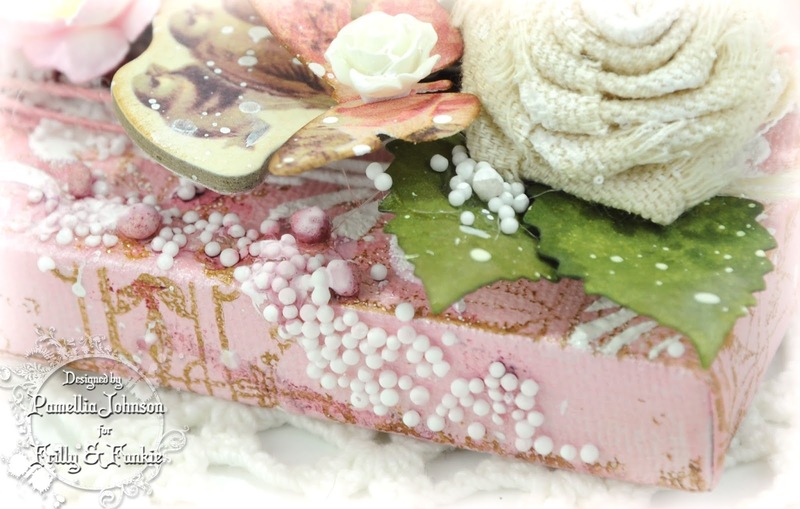 Love the burlap flower and is it next in your flower series videos? Stunningly shabbyliscious beautiful design! Pamellia, what a wonderful ending to your post today! I'm so happy you were able to nurse these two sweeties back to health with your love and serving a special diet. You are a such a kind soul. 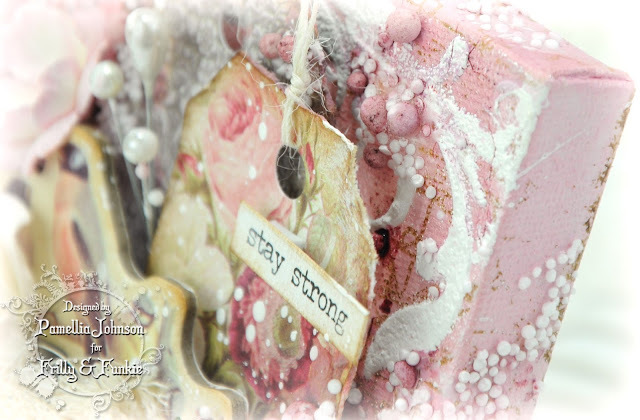 Your tribute canvas is so tiny yet so full of creative layers and details! Gorgeous! And now it's official; I am the only crafter in blogland who has never seen a real art stone! Ha! Ha! Big hugs! SO much beauty packed into a tiny canvas! 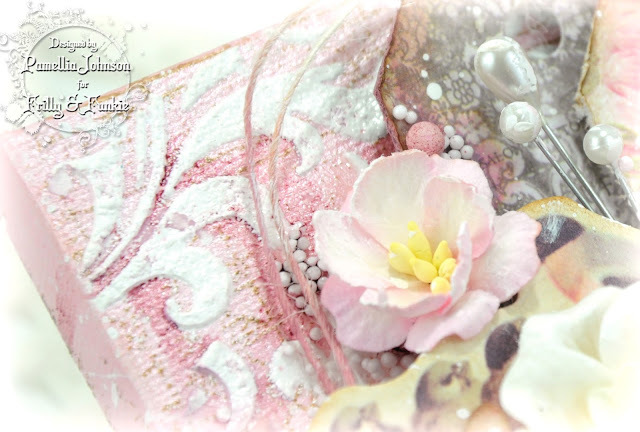 The beautiful details hidden in the many gorgeous layers had me looking at each photo for a few seconds to see it all! The canvas is stunning and so many details in such a small space. So pleased to see Linda and Princess are now in good health, it's a tough world they live in, they must be so pleased you moved into the area.